IT WAS ESTABLISHED rather early in this study that the pentabromo material (compound 1) and the bisphenol A derivative (compound 4) had low solubilities in the commercial resins utilized. As a consequence, they crystallized from the prepared adhesive mixtures to give cloudy, white, solid masses of polymerized resin. This phenomenon would occur even if the halogenated compounds were in low concentration and the halogen:resin mixtures were held at temperatures any lower than about 60°C. This problem of crystallization persisted even with the trihalogenated compounds (2 and 3). However, when these compounds were mixed in a 1:2 ratio (2 to 3 by weight), much higher concentrations of halogenated compound to epoxy resin could be realized (as much as 2:1 by weight epoxy resin:halogenated compounds), and lower temperatures (30°C under a heat lamp) could be used. Hereafter, all references to “halogenated material” will describe this 1:2 (by weight) mixture of compounds 2 and 3. Ablebond¯ resin and HXTAL NYL-1¯ resin were the commercially available resins chosen for this initial study, as they are two of the most popular resins that conservators use for glass restoration. Halogenated material was added to Ablebond¯ resin and HXTAL NYL-1¯ resin in varying proportions. Hardener also was added in varying proportions, disregarding the manufacturers' instructions for a specific proportion of hardener to be mixed with a specified quantity of resin. The samples were cast as small blocks. In this manner, 108 different samples were prepared of 45 different ratios of resin-to-halogenated material-to-hardener. The refractive index of each of the resulting samples was determined. These data were organized in two different ways. 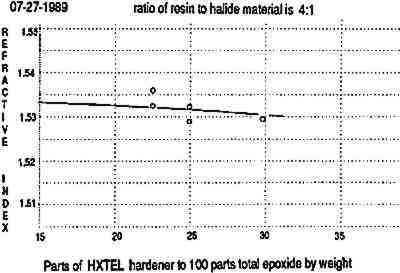 First, the refractive index of each sample with a particular proportion of hardener was graphed versus the ratio of commercial epoxy resin to halogenated material (by weight). This was done for Ablebond¯ resin (graphs 1–4) and HXTAL NYL-1¯ resin (graphs 5–8). The straight lines in these graphs were fit by the method of least squares. Next, the refractive index of each sample with a particular ratio of commercial epoxy resin to halogenated material (by weight) was graphed versus the proportion of hardener. This was done for Ablebond¯ resin (graphs 9–12) and HXTAL NYL-1¯ resin (graphs 13–15). Graphs 1–8 show that the refractive index does indeed increase with increasing proportion of halogenated material in the mixture. These graphs also show that the refractive index of any particular ratio of components (even for pure resin and hardener) is not as reproducible as one might hope. When the data are reexamined with refractive index graphed versus proportion of hardener present, one obtains the set of U shaped curves depicted in graphs 9–12 and to a certain extent in graphs 13–15. The curve minima are located approximately at the concentration of hardener to total resin (resin plus halogenated material) recommended by the manufacturers of the respective resins. Presumably, this may be interpreted in the following manner. With decreasing proportions of hardener, there is a corresponding increase in the proportion of halogen-containing material present in the total adhesive mixture, causing an increase in refractive index. As the proportion of hardener is increased, the relative amount of halogen containing material in the total adhesive mixture is decreased and the refractive index falls. Concurrently, however, as the proportion of hardener is increased, the proportion of cross-linking is also increased. This effect does not become particularly influential until the proportion of hardener in the mixture exceeds the manufacturer's recommendation, creating a material of particularly high density and thus higher refractive index. Note at this point that the refractive indices of both hardeners are significantly lower than those of the resins, the cured adhesives, and, of course, the halogenated material. Thus, if adhesives with very high refractive indices are to be obtained with this three-component system, a hardener containing many halogens is likely to be essential. The natural dark aging characteristics of the epoxy blocks containing the halogen additive were investigated for one year of aging in a light-tight box at ambient temperature. The initial color of the HXTAL¯ resin-based mixtures is much more yellow than the Ablebond¯ resin-based mixtures, particularly at low hardener concentrations. After one year the average At∗ value for the Ablebond¯ samples was 0.01, with a sample standard deviation of 0.005, well below the universally acceptable limit of 0.1, as determined by Down.4 The average At values for the best HXTAL¯ samples after one year was 0.23 with a standard deviation of 0.08. In accordance with Down,4 an At value of 0.23 puts the best possible blocks of HXTAL¯ in the category of “questionable acceptability” when used with these halogenated additives. The yellowness of the HXTAL¯ samples is highly dependent on the proportions of hardener and halide used and on the curing temperature. In particular, when HXTAL¯ was used with less than the manufacturer's recommended amount of hardener and any of the halogenated material at all, significant yellowing of the cured adhesive resulted. HXTAL¯ samples containing halide and cured at a temperature in excess of 60°C were too highly absorbing in the 380 nm wavelength range for our instrument to measure, and thus their At values can be considered to be well into the unacceptable range.